Tight security seems to be a part of our lives now, and so it is with Spring Training baseball, both in Florida and Arizona. Major League Baseball has instituted security procedures at both Cactus League and Grapefruit League games. The following security guidelines have been implemented by many Major League stadiums, although there may be some slight variations in the guidelines for stadiums in Phoenix. You can also expect similar security procedures to be in place for Arizona Fall League baseball games in October and November. However, if you keep these in mind when planning your trip to catch a Spring Training game you shouldn't have any problems at the gate. 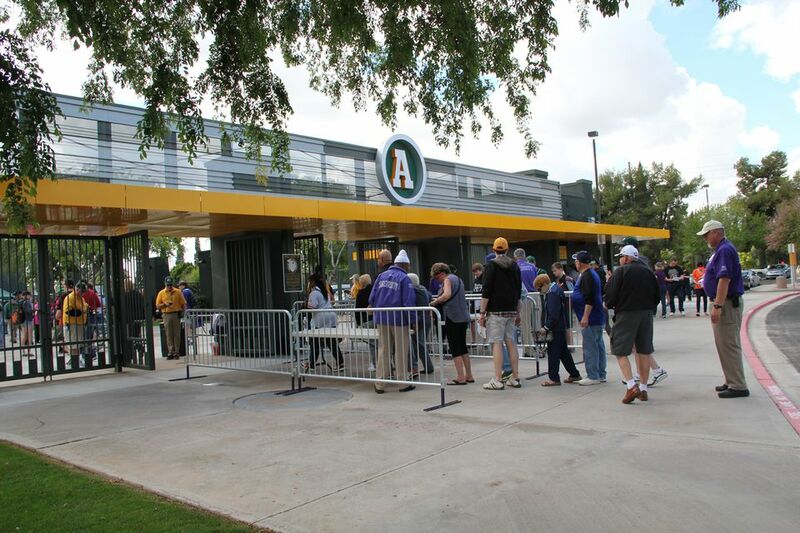 Gates for Cactus League games are usually open about two hours before game time to allow plenty of time for the security screening before the game. When going through security at any of Arizona's Cactus League stadiums will require you to follow some basic rules issued by the Major League Baseball organization. While many items are banned across the board like weapons and glass containers, some stadiums offer special exceptions for things like lawn chairs while others ban even more items. Some stadiums also do not allow lawn chairs of any height, even with berm tickets. Additionally, all fruit must be sliced prior to entry into the ballpark and plastic, factory-sealed bottles of water no larger than one liter are allowed. While some items are not allowed, most things that can fit in a small bag can be brought inside the ballpark, and you won't want to forget your essentials if you're planning a trip to Spring Training in Arizona this year. However, keep in mind that you will get into the stadium faster and with fewer problems if you bring as little as possible. A smartphone with a camera, money, one small unsealed bottle of water, sunscreen, a baseball cap, a glove to catch foul balls, and an autograph pen are all that most people need to enjoy a game. However, you can also bring in some light snacks and creature comforts to ensure you have a great day at the ballpark. Be sure to read up on team schedules, ticketing information, and maps and directions before you visit, and don't pack anything on the prohibited list and you should be all set to enjoy some great pre-season baseball.